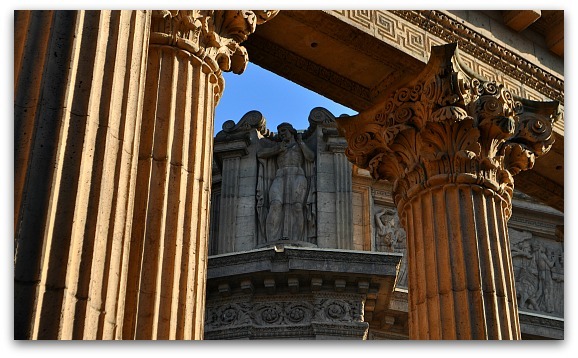 The Palace of Fine Arts is a free attraction that features a beautiful dome and curved columns. It's set in a colorful park on the northern side of San Francisco in the Marina District. It's one of my favorite places to sit back, relax, and enjoy the beauty of the city. It is one of just a handful of remaining structures from the 1915 Panama Pacific Exposition. It's the largest remaining structure and draws in hundreds of visitors a day. It was built as a temporary structure for the expo and was supposed to be torn down. However, both visitors and locals fell in love with it, so the city of SF decided to keep it standing. In the 1960s, the city of SF fully rebuilt the temporary structure to make it permanent. It was then damaged in the 1989 earthquake. The city repaired it and did some retrofitting to ensure its survival during larger earthquakes. They also did more repairs to it in 2009. It celebrated its 100th anniversary in 2015 with several events all year long. Before I talk a little about what you will see when you visit, let's take a step back and look at the history of this structure. You can also click the links below to jump ahead to a specific top for your stay. The 1915 Panama Pacific Exposition was a celebration of the opening of the Panama Canal in 1914. 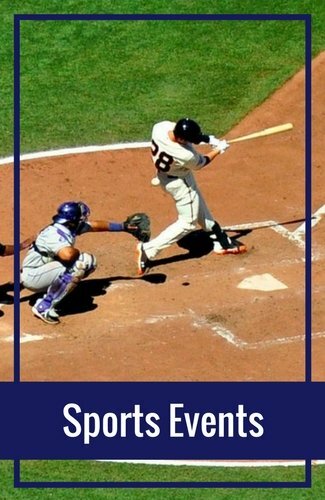 This expo also turned into one of the most important events in the history of San Francisco. Before the 1906 earthquake, San Francisco showed some interest in hosting this large international event. However, after the earthquake hit, city officials knew the event was critical for the city. With millions of visitors expected, it was one of the best ways to showcase how far San Francisco had come after the devastating earthquake. SF was selected as the city to hold this large event shortly after the earthquake hit. 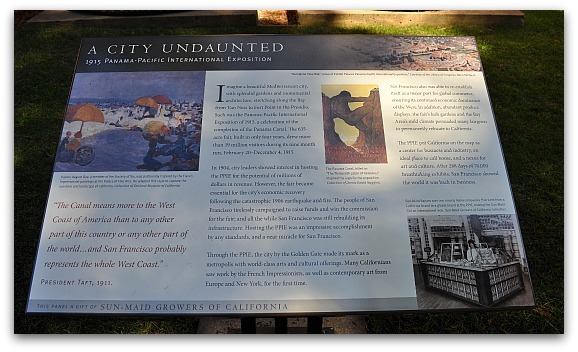 even more about its history and its importance to the city of San Francisco. The site only took four years to build. The buildings covered 635 acres of land in an area that is now the San Francisco Marina. It stretched all along the water front from Van Ness Street to Fort Point. In total, the buildings for the event housed more than 70,000 exhibits from around the world. The Panama Pacific Exposition opened on February 20, 1915. For 288 days, more than 19 million people from around the world visited San Francisco for the event. At the close of the event in December 1915, the buildings were scheduled for demolition. However, the city decided to keep one of the most beautiful buildings -- the Palace of Fine Arts. This San Francisco attraction was designed by famed architect Bernard Maybeck. The entire building is a work of art with intricate details on its columns and beautiful dome inspired by Roman and Greek architecture. It's free to stroll around the outside of the building. It is also the perfect place for a picnic lunch or a place to hang out to relax for a little while. The beauty of the building attracts both locals and visitors. It is very common to see at least one wedding party taking pictures here -- in fact, you might even see two or three during your visit. To give you a sense of work that went into the building, here are just a few pictures from my last visit. The park is open both day and night. 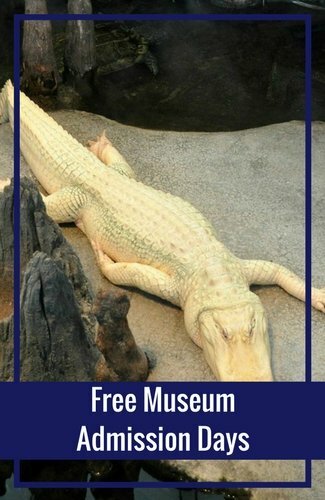 It's free to visit and it usually takes about 30 minutes. You will find it at 3301 Lyon Street. I recommend visiting around lunch time. You can pick up a sandwich or salad in the Marina and spend some time outdoors as you enjoy the Palace of Fine Arts as you eat. There are plenty of places to sit on the grass (shown in green on the map) and all offer amazing views. You will find a few ideas below on where to find some of the best grab and go lunches in the Marina. Inside the building, you will find the Palace of Fine Arts Theater. They offer several performances a month from comedy to ballet shows. 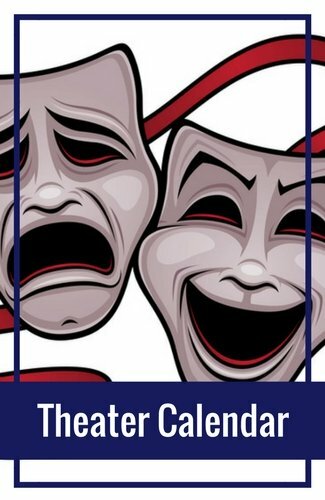 Find a calendar of upcoming performances here. San Francisco Public Library Walking Tour: The San Francisco library has a number of free walks throughout San Francisco. 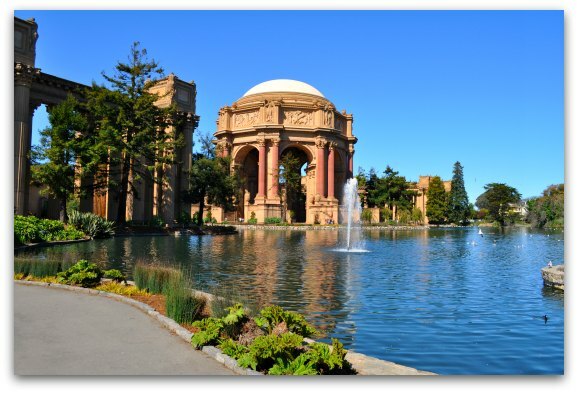 This one is a dedicated tour of the history surrounding the Panama Pacific Exposition and the Palace of Fine Arts. Your guide will also share with you more about the importance of this event to the revitalization of San Francisco. Find out more here. 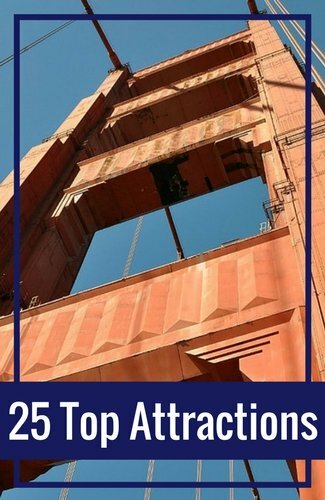 5-Hour Premium City Tour: If you want to see several top SF attractions, then check out this 5-hour guided tour. 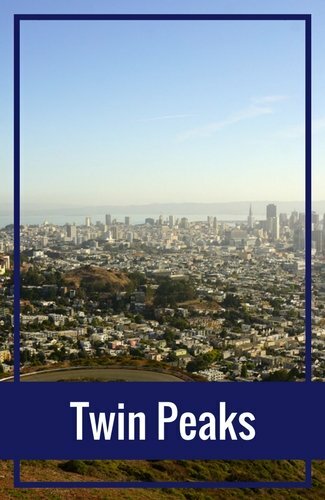 It will take you to several stops around SF in addition to the Palace of Fine Arts including Alamo Square, the Golden Gate Bridge, Lombard Street, Chinatown, and others. It also includes a ferry ride from SF to Sausalito. 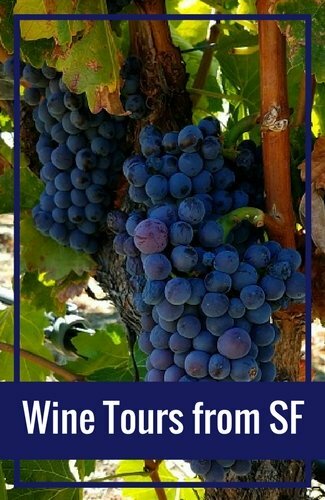 Visit Viator to learn more about this tour and to check for availability. 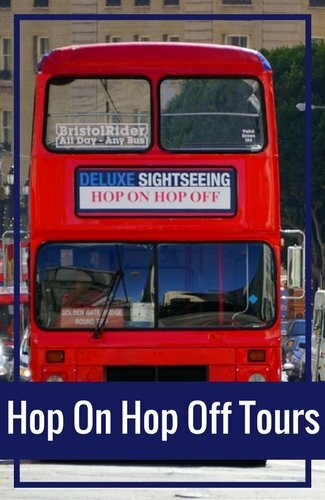 Hop On Hop Off Tour: If you prefer to explore on your own, then check out City Sightseeing's Hop On Hop Off Bus Tour. 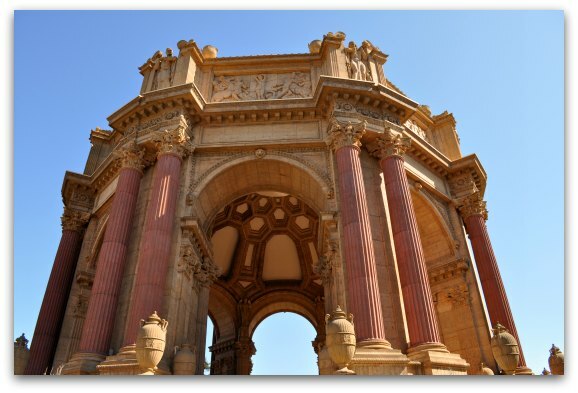 It includes 32 stops around SF including one at the Palace of Fine Arts. You can stay as long as you want and then hop on the next bus to continue on your journey. Visit their site for details and to get $5 off when you book in advance online. The Palace of Fine Arts is in the Marina District and just a couple of blocks away from one of its main commercial streets, Chestnut. Here are just a few places close by that I recommend. As I mentioned above, I love coming to the Palace of Fine Arts with a sandwich or salad and spending time here as I eat lunch or a snack. Here are my favorite places to grab something to bring with me. The Sandwich Spot SF: This is the best place to grab a tasty sandwich. They have a variety of options and are about a half mile away. You will find them at 3213 Pierce. Marina Delicatessen & Liquors: Another great spot to grab a sandwich or a snack and enjoy it on the lawns of the Palace of Fine Arts. It's about 5 blocks away at 2299 Chestnut. Chestnut Street Coffee Roastery: This is another spot that is about 5 blocks away. It's perfect if you need a coffee pick me up for your visit. They also have grab and go sandwiches and salads. You will find it at 2331 Chestnut. If you prefer to sit down for a bit to eat either before or after your visit, here are a few of my recommendations. If you plan to drive to the Palace of Fine Arts, you will find several places to park. Parking on the street is very difficult as this is a neighborhood with hundreds of residents. However, there are several lots within a few blocks of the building. Parking On-Site: You will find a limited amount of parking on-site. One lot is behind the building and the other is on the northern side. If you arrive early or visit during a slow time of the year, you might get lucky and be able to grab a spot right near the park. Marina Green/Yacht Road Parking: If you head just north of the Palace of Fine Arts on Yacht Road, you will find a free parking lot. You are free to park here during your visit and/or while you check out some other local attractions. Crissy Field Parking: Another option is to park at Crissy Field. This lot is also open to the public and free parking during the day. It's about a 5 minute walk from this lot to the park. It's a grass and dirt lot and you can enter it from Mason Street. It's best to select a parking area before you arrive, add in the directions to your phone and then use them to navigate to your parking area. They have closed off certain streets for turning, so it can be confusing when you arrive. By using a map on your phone, it will give you the best directions to get to the lot when you arrive. 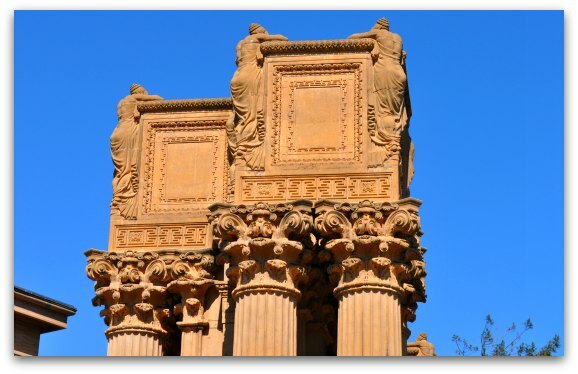 Do the pictures of the Palace of Fine Arts look familiar? If so, you might have seen this beauty in several movies over the years. Here are just a few of them. When the World Came to San Francisco (2015) -- This is a documentary about the Panama Pacific Expo and the Palace of Fine Arts. I highly recommend watching it before you arrive. It's also been featured in several TV shows over the years including Falcon Crest, Monk, Chance and The Streets of San Francisco. The Palace of Fine Arts sits on the northern side of San Francisco. Since SF is only 7 miles by 7 miles, you will find it's close to many of our top attractions and districts. 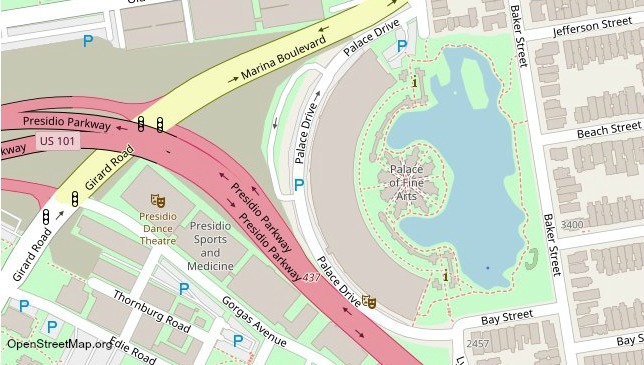 In the map below, the Palace of Fine Arts is the red star. Fisherman's Wharf is the blue star and Union Square is the green star. I've also highlighted Golden Gate Park with the yellow star. Scroll down for additional tips on how to get here from these and other top locations around SF. Pier 39 & Fisherman's Wharf: If you need to travel between Fisherman's Wharf and the Palace of Fine Arts, you have a few options. The distance between the two is about 2 miles. You can walk or take the bus. If you plan to take the bus, pick up the #30 at Columbus Avenue and North Point (or on North Point on the western side of Columbus). Take it to its last stop at Divisadero & Chestnut and you will be about 5 blocks away. Crissy Field: It's a quick walk between Crissy Field and the Palace of Fine Arts. They are less than a half mile away from each other. Walk along Mason to get from one location to the next. Union Square: Union Square is the green star on the map above. It's about 3.5 miles away from the Palace of Fine Arts. The best way to get here is to take the #30 bus. Pick it up at Stockton & Sutter and take it all the way to the end at Divisadero & Chestnut. Golden Gate Bridge: The Golden Gate Bridge is also not too far away. You can either walk along Crissy Field to get between these two attractions or take the bus. If you walk, there is a steep hill with stairs to climb when you arrive. The walk is about two miles to the southern side of the bridge (it's another 1.7 miles across). You can also pick up the #28 bus, which will take you to the southern side of the bridge. You can pick it up at the bus stop at Richardson Avenue & Francisco Street. It's about a five minute walk to the stop and about a 10 minute ride (during non-commute hours) to the bridge. 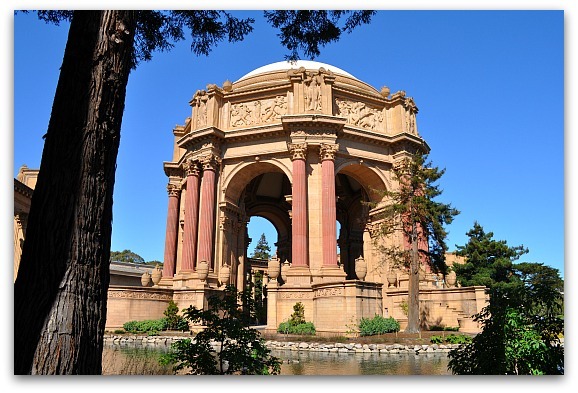 Golden Gate Park: Golden Gate Park is another popular stop for those visiting San Francisco. It's on the western end of SF and is marked with the yellow star. It's about 4 miles from the Palace of Fine Arts. You would take the same bus as the one for the Golden Gate Bridge, the #28. You will stay on this bus and continue on to the stop at Park Presidio Avenue & Fulton Street. From here, you can enter the park and then head to your destination.